This project was funded by Canarie's Network Enabled Platforms (NEP) program. Participating organizations included Northern Ontario School of Medicine, Lakehead University, McGill Medical Simulation Centre,McGill Centre for Intelligent Machines, National Research Council Canada, Communications Research Centre Canada, Stanford University School of Medicine, iDeal Consulting, and Innovation in Learning, Inc. 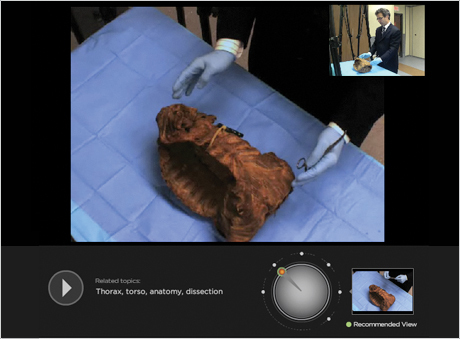 Try the Multiple Angle Viewer to experience multiple viewing perspectives of a thorax procedure (note: no view interpolation on this version). Real-time stereoscopic view interpolation from an arbitrary perspective. Real-time free viewpoint video from a range sensor and color cameras. Pelletier, S.; and Cooperstock, J. R. Machine Vision and Applications, 24(4):739-751. May 2013. 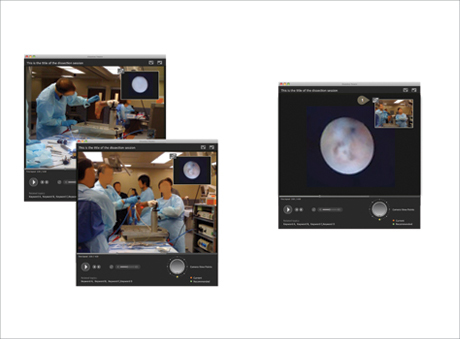 End-User Viewpoint Control of Live Video from a Medical Camera Array. Blum, J.; Sun, H.; Olmos, A.; and Cooperstock, J. R. In International Conference on Distributed Smart Cameras, August 2011. Integrating Simulation Devices and Systems. Ellaway, R. H.; Topps, D.; Lachapelle, K.; and Cooperstock, J. R. Studies in Health Technology and Informatics, 142:88-90. January 2009. August 2010 marked the end of the HSVO project at our lab. During this month, we were busy deploying the camera array at the Medical Simulation Centre (MSC) at McGill. With this final post we share with you some pictures or the deployment and an interesting surgical session where a surgeon at McGill teaches remotely some suturing techniques to a couple of students at NOSM. The video presents a demonstration of our view point interpolation developed as part of the camera array. In these examples, a Time-Of-Flight (TOF) camera was employed to obtain a low-resolution approximation of the scene shape. Images from rgb cameras are then projected onto this model in order to perform view interpolation. VIDEOS: More videos can be found here. This video presents a demonstration of our view point interpolation developed as part of the camera array. A link to our publication on this front will be listed shortly. During the months of April, May and June we will be hosting the Simulation Challenge series. These are a series of activities run with various medical schools in order to test our platform. The Universities involved in the series are McGill University, Ottawa University, NOSM and Cork University. Here we share with you some pictures showing the students interacting with their remote peers. We got the opportunity to travel to Fredericton and meet the HSVO tech team. It was an interesting meeting about Savoir and messages specifications for our platform. Here we share some pictures from the work sessions. We had the opportunity to put together a demonstration involving a high fidelity mannequin, camera array and open Labyrinth. The video presents us setting up the lab in fast forward mode. Within the scenario a 4th year student, Ada, is supervised by a remote instructor, Dr. David Topps, who was the author of the scenario. This demonstration was put together with great help of the McGill Simulation Center; a big kind thank you to them. Background music in the video by Tycho, "Past Is Prologue". We started the year completing our first usability study centred around the camera array interface, and documented in the report listed below. 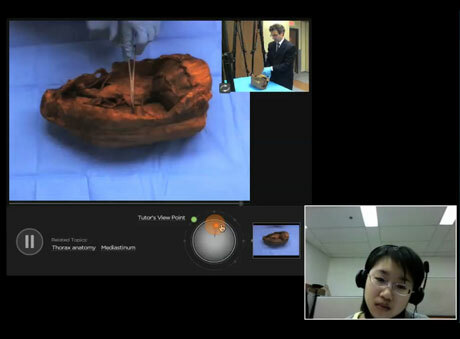 Thanks to all the second year medical students at McGill who came and tested the interface. 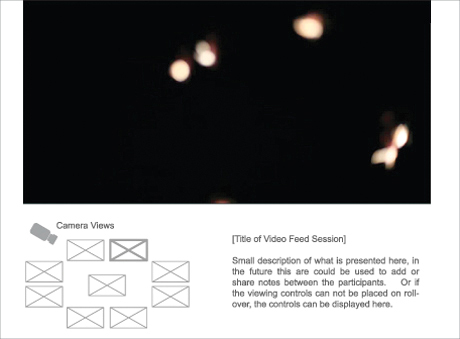 DOWNLOAD: Camera Array Interface Study, tasks and questionnaire forms - private access to HSVO. We had the oportunity to put together a prototype around the physical structure of the camera array. We brought it to the McGill Simulation Centre in order to see how it fits within the actual dissection setting. We also mounted a camera and tested the field of view within this scenario. Through early next year we are hosting a patient mannequin simulator, the SimMan 3G from Laerdal. In these pictures you can see how the mannequin was assembled with instructions via a conference call with Dr. Rachel Ellaway, one of the Principal Investigators. We have named him Patricio for his stay with us. This is another iteration of our camera array prototype. Here we have added a footage of a dissection session of the thorax. We are finishing some of the missing functions and then use it for a series of user testing sessions with medical students. We used the video footage of a previously recorded mannequin simulation session and put together a small flash prototype aiming to show how users could view from different viewing points this session. 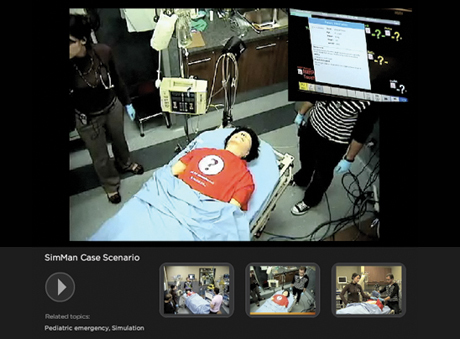 The footage belongs to the pediatric emergency simulation (from an earlier entry). PROTOTYPE: Patient simulation - private access to HSVO. Continuing the various iterations around the user interface for the future HSVO system, another html (image based) prototype has been put together to discuss and test with the team. PROTOTYPE: Overall experience - private access to HSVO. We had the opportunity to video record a session with a mannequin patient simulator. Students had to save the live of a teenager who suffered a severe accident while playing basketball. We then took this video footage and edited for the International Conference on Residency Education, 2009 at Victoria, BC. In the video three different parties get the opportunity to collaborate remotely: a group of students and the mannequin in Montreal, the mannequin operator and a tutor in Ottawa, and another tutor in Sudbury, Ontario. Kind thanks to all the staff at the McGill Simulation Center for all their help in making this possible. VIDEO: Patient simulator session - private access to HSVO. 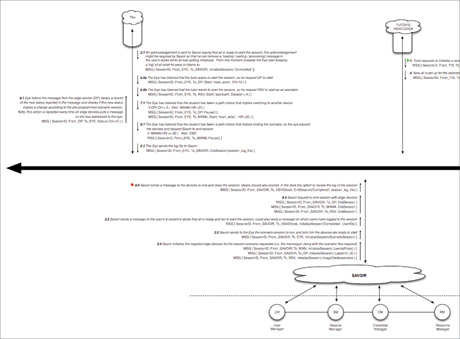 This document present the narrative scripts for the user case scenarios, and the various steps followed by the users in order to complete a task. This script can be read along with the sketch prototype presented in the previous post. DOWNLOAD: Use cases scripts - private access to HSVO. Thinking of how users would call and interact with all the tools and services deployed with the HSVO system, we started to sketch out the overall interface. The pictures presented here shown some of the line of thought. The sketches were scanned and used to create an low fidelity html prototype to discuss and test with the team. 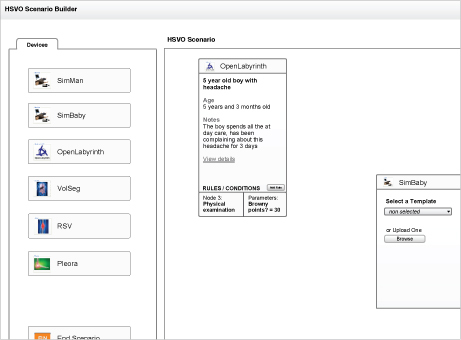 PROTOTYPE: HSVO sketches - private access to HSVO. The McGill simulation center has already the capability to record dissection sessions and surgical procedures with a camera mounted in the ceiling. The camera can be operated remotely (position, zoom, pan and tilt). Given this, we took the job of watching hours of their recordings in order to learn how often they update their camera view point and zooming settings while recording a session. We had the opportunity to put together a prototype in order to show how users could interact with the camera array. 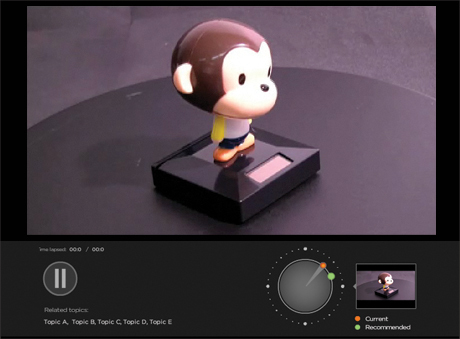 It is called the monkey prototype because the 36 viewing points are video shots of a plastic monkey moving his head. The photographs presented here present a scale model of some of the ideas we have been brainstorming around building the physical array of cameras. This document present the persona, use case scenarios and another user interface proposal for the camera array. 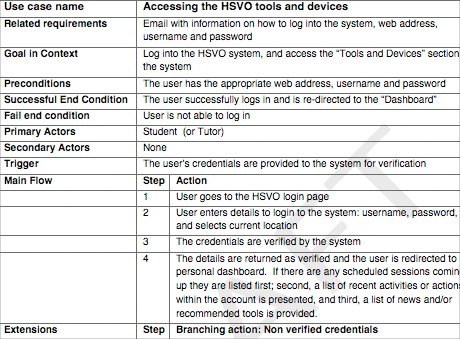 DOWNLOAD: Documentation - private access to HSVO. 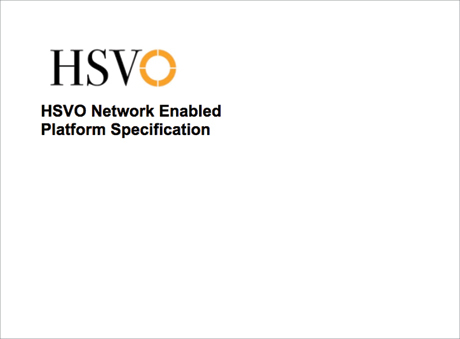 The reports listed bellow present the discussions and contributions around the definition of the specifications of the HSVO Network Enabled Platform, part of it was based on our previous field studies studies. DOWNLOAD: Briefing papers Ver 1.2 and Ver 2 private access to HSVO. Please note that the final documentation now lives in the official HSVO repository. 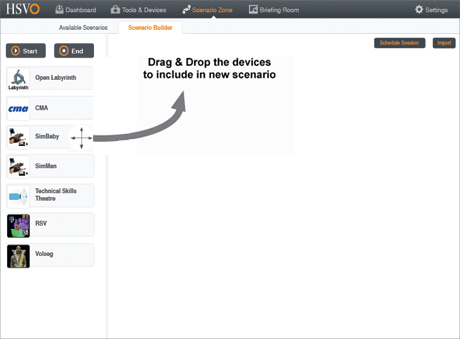 We have put together a script around a remote teaching scenario. Here the tutor explain to her local and remote students the various knee pains that cyclists could develop. The scenario makes use of an early prototype of a camera array, and two visualization tools Volseg and RSV. DOWNLOAD: Script - private access to HSVO. VIDEO: Knee pain in Athetes - private access to HSVO. 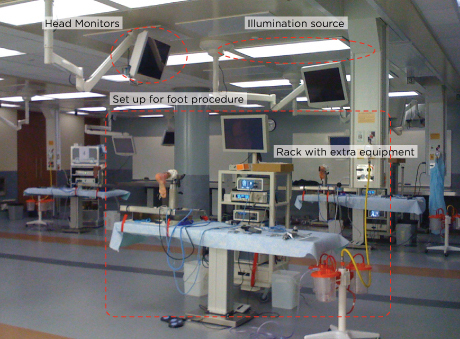 This communication diagram presents a round trip medical scenario using two tools (or edge devices): a mannequin patient simulator and OpenLabyrinth . This diagram depicts the earlier thoughts about the messages needed to be passed to and from the core of the HSVO system (known as SAVOIR). DOWNLOAD: Report - private access to HSVO. Allowing tutors to build medical scenarios with various tools (or edge devices) is at the core of what the HSVO system. This document presents the first paper prototype of the user interface that aims at facilitating this task. This document present some early thoughts around the user interface for the camera array. This became our first web prototype in Jan, 2009. The illustrations here represent aim at describing the overall scenarios that the HSVO project will cover. All the observations from the previous fields studies led into the description of the various messages that would be required to be passed across the HSVO system; in order to ensure a smooth collaboration between the medical students and tutors. 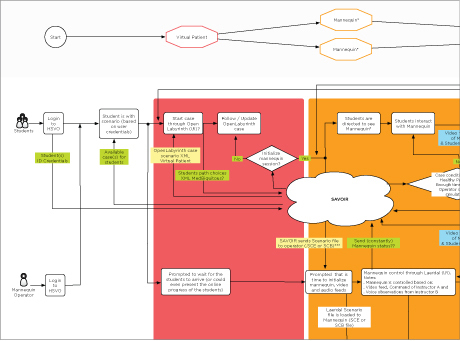 The various flow charts and UML communication diagrams developed in order to depict the data flow and interaction are listed bellow. DOWNLOAD: Reports Ver2 - Ver3 - private access to HSVO. We had the opportunity to put together a small cartoon scenario with our team members at NRC lead by Prof. Bruce Spencer. The cartoon describes a remote collaboration and simulation scenario between various medical practitioners. Kind thanks to my friend Adrien Sanchez Valero for creating the cartoon stills. In this other "Fly in the Wall" session we now looked at a dissection session. During this session we had the opportunity to observe a foot endoscopy training session with approximately 15 medical residents. The figure on the left present the overall set up at one of the working stations. The intentions of this observations will play an important role in the future design of the camera array structure and user interface. Running a patient simulation with a mannequin requires various preparation steps. 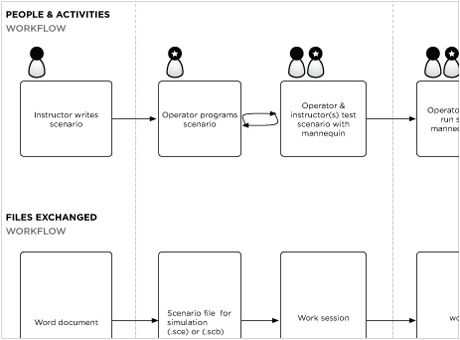 The diagram linked here present an overview of these preparation steps and interactions in terms of people and the files created before, during and after running the simulation session. 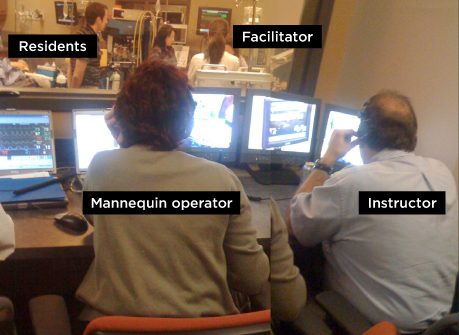 We started the project with a series of "Fly in the wall" sessions at the McGill Simulation Center The figure on the left shows a typical set up while running a medical patient simulation with a mannequin. The report linked bellow, describes the scenario observed, the number of players involved, their interactions and means of communication. Overall, it was rather interesting to learn the importance of having vocal and auditory communication between the instructor, mannequin operator and facilitator.